This narrow strip located along the intersecting streets of Dos Castillas, Laon-Laan, and Dimasalang in Sampaloc, Manila is open 24 hours—making Dangwa Flower Market a go-to place for husbands looking for a late night gift for their wives, people in search for an instant bouquet for a friend’s birthday, or those looking for a token of sympathy for a family which has just lost a loved one. Flower sorters make sure that stalls get only the freshest flowers daily. Although this setup is convenient for most consumers, it is also a somewhat sad picture of how much the flower district has changed, 42 years since the first stalls started selling flowers along the sidewalk of the Dangwa Tranco Terminal. 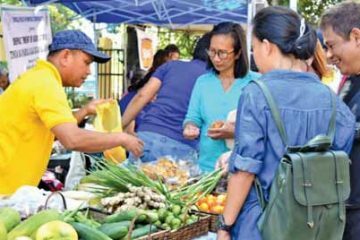 “Competition among flower vendors is tough,” said Agapita ‘Nene’ Pamulaklakin, owner of La Pimer Nene’s Flower Shop, one of the pioneer stalls of the Dangwa Flower Market. “Before, our flowers used to sell [so quickly] that even before lunch time, we’d be able to close our stalls already. But because there’s now so many of us, we even have to open 24 hours just to sell our products.” Pamulaklakin is a former president of the Dangwa Flower Market Association. And it’s easy to understand why. The Dangwa Flower Market used to be home to only seven flower vendors, all selling beautiful blooms brought to Manila by Dangwa buses which arrive daily from Baguio. 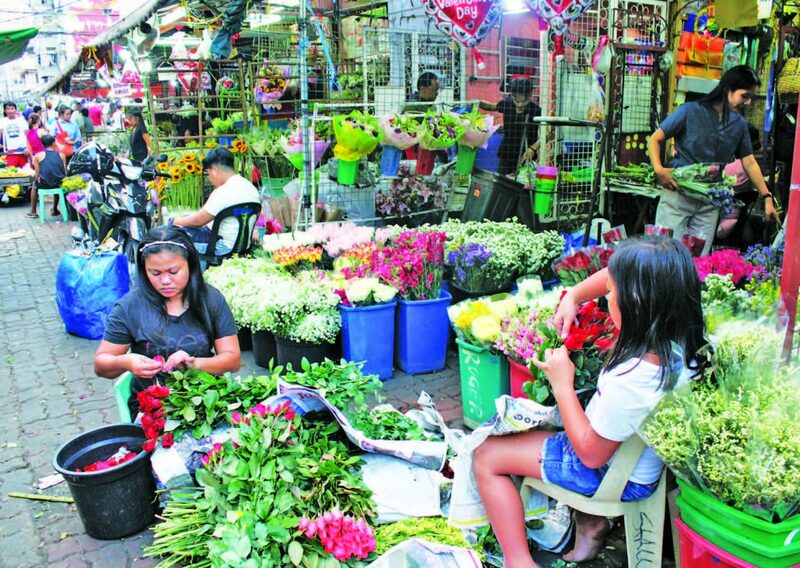 Since former Manila Mayor Lito Atienza recognized the area as the city’s official flower district in 2006, the number of vendors has gone up to more than 150. 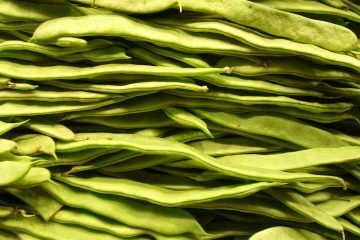 The history of Dangwa started when enterprising individuals from Sampaloc got vegetables from the highlands of Benguet via the Dangwa buses that traveled to Manila on a daily basis. Aside from the vegetables, they would also bring cut flowers which would be delivered to flower stalls in Quiapo. The flowers which weren’t sold would be left at three apartments along Dos Castillas. These leftovers would then be displayed and sold along the sidewalk near the terminal. The flowers would become very popular, and the three apartments would eventually become the first stalls of Dangwa. Readily-made bouquets and sympathy flower wreaths are available for people on the go. According to the pioneers, the ‘blooming’ of the flower district can be attributed to former First Lady Imelda Marcos. She would order flowers in bulk from various flower shops to decorate Malacañang. 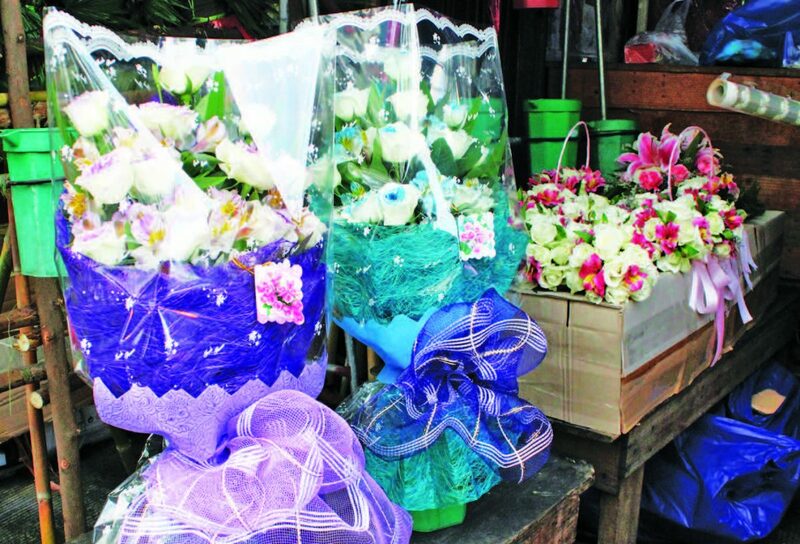 These shops would often go to Dangwa to purchase the freshest blooms. “There were very few selections back then. We were only supplied siestas, calla lilies, and gladiolas. There were still no roses to sell, but the interest of the people grew,” Pamulaklakin shared. Eventually, the buses would drop the flowers directly at Dangwa instead of Quiapo as the orders grew. In time, the shop owners would also order different cut flowers such as orchids from different places around the country, including Laguna, Bulacan, Tagaytay, and Davao. 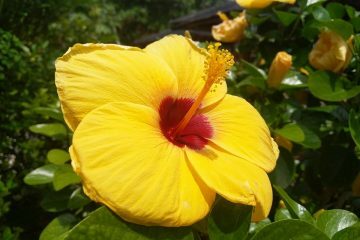 They also imported flowers from other countries like China, Malaysia, Thailand, South Africa, Ecuador, and the Netherlands. Today, Dangwa gets almost 40 million metric tons of cut flowers every year from Benguet alone, according to the Municipal Office of the Department of Agriculture, and has the most buyers compared to other places in the city, like Quiapo and Baclaran. In 2006, Mayor Atienza formally transformed the Dangwa Flower Market into a destination—paving the street, putting up flower-themed lampposts, and establishing the Dangwa Flower Center so more vendors could start their businesses. 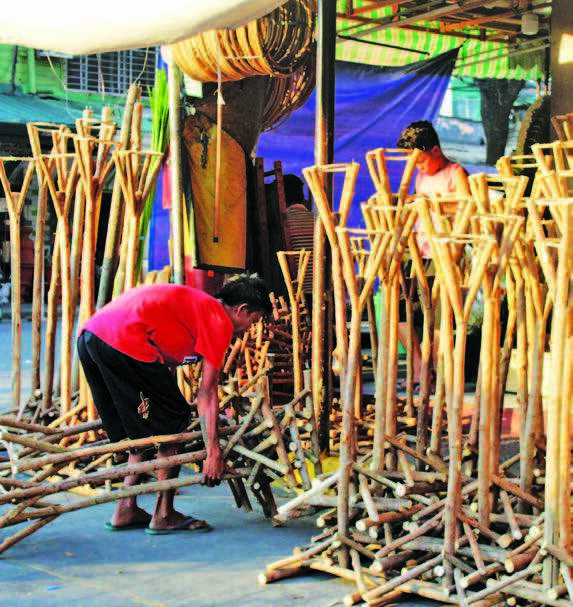 Almost all flower shop requirements can be sourced in Dangwa such as these wreath stands. “It was a welcome development then because we [were] no longer considered…illegal [traders], to the point that the police] used to confiscate our flowers when we [sold these] on the streets. 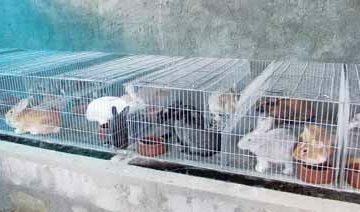 It’s now very safe for our customers to shop for flowers in Dangwa,” Pamulaklakin said. 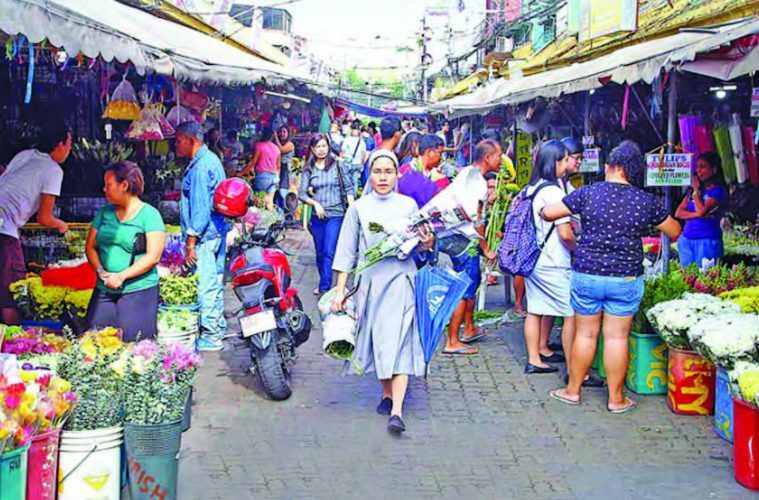 Aside from the vendors, different groups such as the Dangwa Flower Arrangers Association would be formed to promote the flower hub’s unique and crafty way of arranging blooms while charging low rates—almost 40 to 70 percent lower than most flower shops. 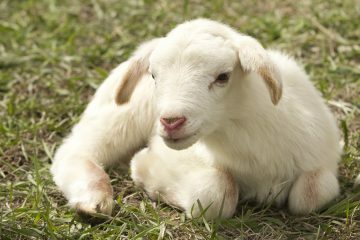 Dangwa is usually quite busy on special occasions like All Soul’s Day, Easter Sunday, Mother’s Day, and Valentine’s Day. The biggest challenge now being faced by the vendors of Dangwa is the presence of too many sellers and illegal vendors. “There are many former flower arrangers who would approach possible customers and offer to do flower arranging for them at really low prices. They would get the flowers from us, but many would just pocket what the customers paid them. 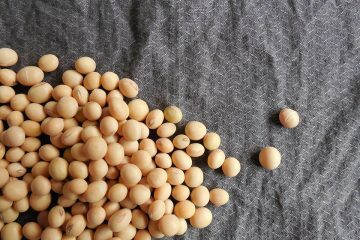 This is actually a growing concern, and it’s making us lose more customers,” Pamulaklakin said. She, along with other flower vendors, hope to establish a more secure and streamlined business in the future, one in which both businesses and customers can continue to benefit and thrive in Manila’s biggest flower market. “We hope that we could do something about it. If not, the oversupply of flowers and the presence of [unscrupulous] individuals would affect our business. We want to pass our [businesses] to our children. So hopefully, there are still blooming opportunities in Dangwa in the future,” Pamulaklakin concluded.